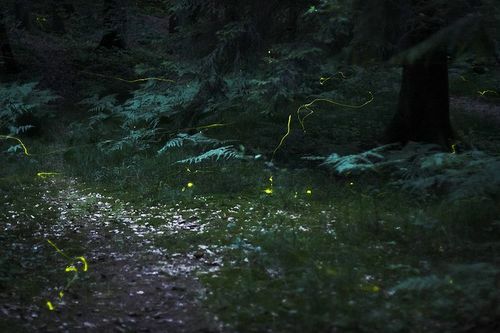 The fireflies in my park are beautiful this summer. Normally I’m not in the park that late – Aggie prefers her schedule to change as little as possible. But between the heat (pushes to after 7pm) and my evening class (to after 8pm) I get a wonderful view for at least 2 nights a week. The combo of the growing moon and the fireflies is just beautiful. I can almost imagine that I can’t hear the roads, even from the middle of town. And I can rekindle my fantasy of a cabin in the woods and hearing no “town” sounds, watching fireflies and wildlife drifting through the fields and listening to owls.